In a medium-large mixing bowl, cream softened butter with brown and white sugar. Use an electric hand mixer if you have one, but manual with a wooden spatula is good, too. When the butter-sugar batter mix is thorough, add eggs, vanilla extract and sour cream. Continue to mix the batter. In a separate mixing bowl, add flour, salt and baking soda. Mix thoroughly. Slowly incorporate the flour mix into the batter while mixing thoroughly. The batter should be fully formed. Add chocolate chips and fold the batter until fully mixed. On a cookie sheet, layout the cookie doughs scooping approximately 1 tablespoon of the batter. Leave plenty of room between each scoop because the cookie will flatten out and expand in all directions. Bake for 10 minutes or so. Keep an eye so that the cookies don't get burned. Remove and cool down the cookies on a plate or a cooling rack. Cookies should be tender, kinda chewy because of the sour cream. Don't add the sour cream if you want your cookies harder. Repeat to use the rest of the batter. If you choose not to cook the cookies all at once, seal the unused batter in a container and freeze it. 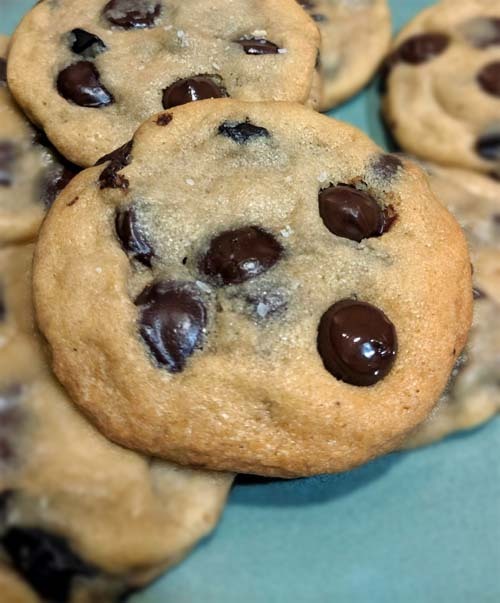 Also check out recipe for double chocolate chip cookies.